Why is it a Great Gift ? : Spa treatments make a delightful gift for your special someone. There are few other gifts, with perhaps the exception of diamonds and fragrances, that are cherished as much as a spa set. Send one today and make her day! Enhance bath time with Linden and Mimosa, a mystical blend known for its refreshing, revitalizing, and restorative effects. 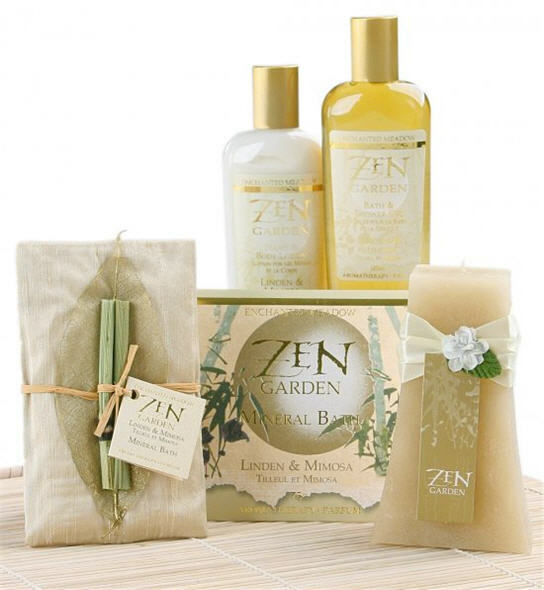 Elegantly wrapped in a bamboo sheath are a satin sachet of bath crystals (75 g), an envelope of mineral salts (76 g), bath & shower gel (4 oz), a scented pillar candle (5), and hand & body lotion (4 oz). A gift to enhance the recipient's mental, physical, and emotional well being. Measures 12 x 6 x 2.5 Inches and weighs 3 lbs.